I’ve never been real comfortable with “Ticketmaster”. Whenever I use the site they have service fee upon service fee heaped upon the purchase. They’re kind of like the “Bank of America” of ticket sellers. For example, last month I purchased tickets for a local play (Footloose) for myself, Michelle and 3 friends. The original ticket price was $15. Then Ticketmaster ladles on a $4.75 “Convenience Fee” per ticket (anybody know what the heck that really means?). Then there is the “Order Processing Charge” $3.65 (seems reasonable enough) and a “Ticketfast” charge of $1.75 (cost for them to allow me to print my own tickets). This increases the final cost of the tickets by nearly 40% of the originally stated price. So, recognizing and finally accepting that there really is no way to pay the advertised price for Ticketmaster tickets, and that they’ve got most venues around here locked up (does anybody know how to get tickets without going through Ticketmaster? I mean besides making an extra trip down to the venue to purchase them.). I picked up tickets for a show next month that were supposed to be $39.50 each. The “Convenience Fee” for these is $6.75 per ticket. Now they have a $2.00 “Total Building Facility Charge(s)” per ticket (?). I get a break on the Order Processing Charge as it is “only” $3.60 for the order, but they easily recoup that by increasing the “Ticketfast” charge to $2.50. So my $39.50 tickets are now $51.30 each or 30% more than the advertised price. “Fine”, I tell myself. Michelle will really enjoy the show and I really don’t have a lot of options. This morning I get an email from Mondial Assistance thanking me for purchasing “Event Ticket Protector Insurance”. but pretty much tell you that you need to deal with it on your own. I know that I did *not* intentionally elect to take any insurance – 15% ($6 insurance vs. supposed original cost of ticket) is WAY too expensive for such protection and the risk that I’m going to miss a 2 hour performance is not really all that great (vs., say, the risk of missing a vacation package that spans a week or so). But what is galling is the fact that I saw no mention at all of this insurance on Ticketmaster’s site when making the purchase. If there *was* it was not obvious and the little note at the top of the page saying “You have 2:15 to complete this form or you’ve gotta start over” would definitely impact your ability to carefully inspect your options. As it is I haven’t seen the charge applied against my credit card yet, but this *is* the weekend. I’ve got a note on my calendar to check on Tuesday and cancel it. It’s a small amount of money but , gee whiz, don’t you just hate being taken for a ride? To their credit, Mondial’s VP of Marketing Communications contacted me after reading this blog and offered to initiate a refund of the premium for me. I had this on my “to do” list for the afternoon but I felt this was a nice gesture. The scenario you described was quite alarming to us and I want you to know that I have looked into it. I can assure you that we do not automatically charge people for the insurance. This type of “opt out” marketing practice is not used on Ticketmaster’s website. Each ticket purchaser is given the option to purchase or not purchase insurance. I cannot say for sure how the option was presented to me, but I know I would not have opted in. And Ticketmaster’s reputation, being what it is, would leave me comfortable in the assumption that they were implementing an “opt out” strategy. After all, they are already selling tickets for more than the face price in the first place. I see that the initial charge for the insurance premium has been applied against my charge card. I have already received confirmation that the insurance has been canceled. I’ll post to confirm that the reversal of charge has been applied as well. I want to note that the credit for Mondial Assistance’s insurance premium showed up on my credit card account a couple of days ago. So they were true to their word on canceling and reimbursing me for the insurance. Compaired to other websites that you have designed, or other websites that you have used, can you honestly say your experience was a convience? If no, take them to small claims court since you were charged for a convience that was not provided. Have you heard the fuss going on up here with them? There are several stories in the paper about their practices lately. @Alison – Thanks for that link Alison, that is VERY good news indeed. I’m the type who votes with my dollar and, years ago, my vote was to simply stop going to shows. But lately I’ve been feeling the itch to attend some shows and it absolutely galls me the excessive profiteering being indulged in by these cretins. I just heard on Clark Howard this morning (podcast) that Ticketmaster is thinking of merging with another, equally shady, group (Live Nation)and shedding the hated Ticketmaster name so they can rip us off using an obscure new name. No doubt the name change will help in delaying or confusing similar class action lawsuits to the one you point to. Wow! You have to wonder where the FTC and the Canuck equivalent of the FTC are in all this. Given how fuzzy their mandate is I fall back on “protect the consumer from monopolistic excess”. Either they have lost sight of their purpose or they are simply corrupt. @Marc – So they contacted you just based on the blog? They monitor these things? It doesn’t have to be too onerous, setting up Google and Technorati to notify you if your keywords are mentioned in a blog is a fairly simple and prudent way to keep your finger on the pulse of your brand’s popularity. We had the same charge for insurance as you – and we didn’t know we “selected” it either. I feel like we have been SCAMMED! Our $18 circus tickets cost us $30 with all the extra fees of Ticketmaster and the insurance. When we got the email thanking us for the insurance purchase, we figured it was part of the Ticketmaster fee, but when I noticed a $42 charge on my credit card (which was not listed when I confirmed purchase) I was appalled. I immediately called the company but was told it was more than 10 days and the event had already take place. In no way did we intend to opt-in for insurance. I’m waiting for a call back from Felicia – apparently she may be able to do something, but the first two women I spoke with could do nothing other than explain its part of the “Terms and Conditions” we agreed to when selecting the box. “Terms and Conditions” of who? Ticketmaster? Mondial? I couldn’t tell you since we had no clue we opted-in. I’m much more suspicious of Ticketmaster than I am of Mondial in being the cause of the mistaken insurance purchases. @Marc – The same thing just happened to me, I received my credit card bill today and found a $48.00 charge for insurance on the ticketmaster tickets I had purchased. I too was told on the phone that it was past the 10 day period and they couldn’t refund my money. I have sent an email to customer service requesting they refund the charges. I will see where this goes. I am going to contact my Visa holder tomorrow in order to dispute the charge. I received an email today from Mondial, they have canceled my “policy” and have refunded my $48.00 It sounds like they are a decent company, unlike our friends at ticketmaster. @Scott – Hey Scott, I’m glad that your experience turned out OK. It seems that Mondial simply has to “deal with the devil” and they risk being painted with the same broad, and negative, brush that colors all Ticketmaster transactions. They are at it on my side of the Atlantic too. After buying some tickets from Ticketmaster I got a suprise email from Mondial thanking me for taking out a policy. £5.62 on £60 worth of tickets – not even good value. I phoned and have cancelled it (hopefully). From the unsurprised tone of voice of the woman I spoke to at Mondial I am not the first person she has dealt with on this subject. I abhore this sort of behaviour! Large corporate bodies taking the Michael. Yes I am the recent recipient of an email from Mondial “thanking” me for opting for insurance that I have unknowningly opted for. The email came just today, so under the terms I have the full 14 days to cancel (well 12 days anyway – today being a Saturday and their offices not being open at weekends). It the principle that gets me. Yes I can cancel, but now I have to waste time and the cost of a phone call to do so. I purchased tickets for a football game through Ticketmaster and decided to purchase Mondial Assistance insurance. It was the first time I was ever offered the insurance and I thought for the price of the insurance compared to the ticket price I would purchase the insurance. It just so happens that we got sick and were not able to attend the football game. I remembered that I had purchased the insurance so I filed a claim and mailed everything that is required including the doctor’s statement from ER. NO response so I called and the next thing I know I receive a letter telling me that the claim would not be processed because it was not complete. So I call Mondial again and I am told that 2 tickets were not submitted with my claim so I fax the entire package one more time. I was lucky I had copies because it just so happen that Ticketmaster could not provide copies it appears I missed the date by a few days? I called and confirmed that my fax was received. (April 15, 2009) After another week I received another letter telling me the package was again incomplete so I call again and fax Mondial once more. After 2 weeks (May 11, 2009) I called to get a status and I was told that they needed to get clarification from the doctor. Mondial wanted the doctor to state, 5 months later, that my wife was too ill to attend the football game. I explained to Mondial that we did not mention the football game to the doctor therefore he could not make a recommendation not to attend the game. I also told Mondial that the ER visit was for treatment not to get coverage for the event insurance policy. My father’s health turn a bad turn after this and he died on August 7th. On August 11, 2009 I called Mondial to inquire about the status of my claim and I was told that “The Claim was closed for NO ACTIVITY”? No activity on whose part? I was told to leave my phone number and I would be called tomorrow by the ticket claims department. This is too long to play this game with them. If I am not called tomorrow I will contact my attorney to deal with Mondial’s obvious attempt to avoid paying for a valid claim. Either Mondial is a rip off or they have employees who don’t do their jobs. Either way Think Twice before you spend money for event tickets and for insurance on the tickets. IT APPEARS THAT ALL INSURANCE COMPANIES ARE SAME. Just purchased Lynyrd Skynyrd tickets and the next day the mail from mondial arrived, closely followed by a note saying my purchase had failed at this time. Beware also that if you call at the wrong time of day or on the wrong network you can easily rack up a bill greater than what they are originally asking for. 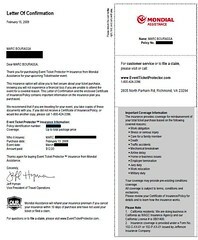 As a lot of the comments above I have just purchased tickets from Ticketmaster only to get an e-mail to say thank you for purchasing Mondial Assistance Missed Event Insurance which I most certainly did not. I immediately sent an e-mail to Mondial to cancel. Hopefully I can telephone tomorrow to cancel. I only purchased a £20 ticket so why would I want insurance. Its not worth it. Has anybody actually read what they cover? I am planning to actually use this insurance to file a claim on two tickets that cost about $80 each. BUT after reading what they cover, I’m a bit unhappy on how strict they are about it. They only cover basically the extremes of unforeseen accidents, and of course you need to supply accurate documentation for them to actually reimburse you for the tickets. @Tony – Hey Tony, This is why I limit my insurance to only big ticket things: House, car, medical, etc. And I would say that I barely grasp what I’m insured for. I’ll talk to my various agents every few years, present scenarios that I may have concerns about and have them tell me if I’m covered or not. For me the stress of trying to force someone to honor their commitments is a very high non-financial cost that must be factored into these things. If you don’t mind fighting for every little thing then this kind of insurance is probably OK. But I’d rather risk the loss of $160 and not bother with the insurance – especially since it seems unlikely that you’d be covered anyway. Avoid Mondial, the policy is a joke. I purchased a pair of tickets that cost $67 each. As luck would have it, I came down with the flu and we cancelled our trip. The policy requires a doctors visit to deem that you were too ill to travel. I do not visit the doctor unless I need to and did not for the flu. By the time I would pay for the doctor, I may as well eat the ticket price. Claims service is VERY slow and noted by others here. Communications are poor. I too have just been hit with this charge and what’s more, it meant that I went overdrawn on this account and I was charged by my bank – talk about insult to injury. It’s absolutley criminal that this sort of thing can happen. I can only assume that you are supposed to opt out during the ordering process, a process that has you typing against the clock to secure your tickets. When I live in the UK the law was changed so that any such extra services were done on an opt-in basis to youhad to physically select them if required. This is exactly what I’ve come to expect from Ticketmaster though. I was once given some Ticketmaster vouchers as a gift when I left my job. I wasn’t aware they had an expiry on them and missed the deadline for use. It’s scandalous…!!! Why should they expire? Ticketmaster have the money and have indeed been drawing interest on my investment for 12 months and now they just take the money and keep it. How is that fair or just. TOTAL SCAMMERS in my opinion and something should be done to stop this underhanded thievery…!!! I purchased paperless tickets through Tickmaster and Bought Mondial Assistance Insurance to cover my tickets. I travel on business and may not be able to use paperless tickets on a given date. I found out that I had to attend a sales meeting in another state and couldn’t use the paperless tickets. Mondial DOES NOT cover this situation and won’t refund your money after 10 days of the purchase of the insurance. Be advised – you can be ripped off by Mondial. I purchased 2 tixx to the NY-Penn League All Star Game via TicketMaster & got charged the insurance fee, when I didn’t even select it. Mondial was nice & refunded it, but it is TicketMaster I’m gonna feud with. I will force them into refunding me $5 per ticket. When they refuse, I’ll threaten to go public. I had exactly the same experience a few days ago. What a bunch of con artists. I hereby pledge to avoid Ticketmaster whenever possible. I’ve experienced similar problems with Mondial Assistance as noted by other posters. I purchased the optional insurance for a pair of concert tickets. As luck would have it, my husband and I could not attend because our daughter was ill. I immediately filed a claim and then received absolutely no response from Mondial. I waited the required time and emailed Mondial’s customer service, only to be told to wait some more. At my third attempt to bring this to a conclusion, they sent me a ridiculous, nonsensical form for my daughter’s pediatrician to fill out. I suspect they employ delay tactics to “encourage” buyers to drop their claims. They are charlatans and their service is the worst kind of scam. I will do my utmost to avoid Ticketmaster in the future and will certainly never be foolish enough to buy the insurance offered by Mondial again. @ Jennifer, I am experiencing the same issue right now. In the case of illness, Mondial expects your pediatrician (or a friend’s, which is even more ridiculous) to file an EXTENSIVE form detailing why he/she could not attend the event. Obvious ill-business practices. Similar to the scam with rebate forms, they assume people are too lazy to fill them out. Wish I could have read their policy before I paid for the insurance. Didn’t end up going to a show. Thought I would be able to get my money back since I paid for insurance. You will get a refund for “Your death.” That’s number four on the exceptions list. So my advice is die in a nuclear apocalypse if you want your money back from Mondial. Same thing happend to me. Ordered 2 $25 tickets and was thanked for $14 of insurance from Mondial. I am pretty savey and did not select insurance. I called them and they said they would credit the $14. A 10 minute ticket purchase turned into a 30 minute ordeal. How many folks shrug it off??? I think there is a kickback to Ticketmaster or Mondail is a subsidiary. Mondial Assistance is a SCAM! My master card (MBNA) has purchase protection of stolen items up to 90 days. The insurance of this protection is Mondial Assitance. The requirement of submitting a claim above $500 is the receipt of the payment, the mastercard statemment of the month the phone was bought, a statement by the notary public stating I DO NOT have other insurance that covers the lost (which is $30), an incident report from the police office of the incident ($50). I spent money and time to gather all the information and finally submitted the claim. After about a month, I called to check my status and of course, they haven’t reviewed my claim yet and told me to check again after 10 business days. After another 1.5 month, I had no response from the company and was a bit worried so I called and discovered that they have neglected the claim and it has NEVER been reviewed. The rep there told me to call back in 5 to 10 business days to check the status. After a couple days, I’ve received an email from a rep and told me to explain the incident again and I explained to them how careful I am with my purse and I’d never forget to unzip it. I always check to make sure my money and phone is in my purse from time to time, especially in a club, however, the phone was missing when I checked it and thus I realized my phone must be stolen. After about a week i received a rejection letter from the insurance and the explanation of the claim denial is: This claim falls under the exclusion “mysterious disappearance” as defined in your policy. The policy defines this to be when the article or personal property in question can’t be located and the circumstances of its disappearance cannot be explained and do not led themselves to a reasonable inference that a theft occurred.” I was like WTF??? How would I know when someone was stealing my phone, If I had known I’d have caught the thief already!!!! and how should I explain the phone’s disappearance if someone is intentionally stealing my phone!!! I even supported my claim with an incident report from the police and that’s not enough? The company is just using every reason to deny the reimbursement! This stupid insurance is a SCAM and they cannot provide any protection but disappointment!!!!! I spent time and money to protect my benefit but in the end they gave me BS!!! I’m gonna dispute the result for sure!!!!!!!!! DO NOT GET THIS INSURANCE!!!! this has happened to me as well..£40 tickets and £8.98 insurance…not happy at all…i did not agree to this…it is certainly not clear on the website about it..i have emailed ticketmaster..no response…my event is tomorrow..i have to get through to mondial tomorrow to try and sort this out..i will not be buying from ticketmaster again in the future!! I’ve just done exactly the same thing on the UK site – for the very same show in fact! What an absolute con that site is. I agree, the insurance is a scam. The worst part is that you are not informed of what the insurance does and does not cover when you purchase it. You only have seconds to decide whether or not you want it. I started to file a claim, but at every point was told by the representative that I was disqualified, but when I came back with an explanation of how I was qualified, she would move on to something else. It was clear that she was just trying to get out of payment for Mondial. purchased tickets from ticketmaster uk. Automatically sold insurance from mondial assistance. I had a look at the purchase page and there’s quite a spiel about insurance with a YES or NO option. Why have a no option, that suggests to me that you need to OPT out by selecting no. An email from a Lawrence Rogers at mondial assistance did not help when he said “you need to select yes or no”. Again suggesting to me that if you dont select no then youve opted in. Its easy for them to simply say youve selected insurance but Im equally positive I did not. I also received an email thanking me for purchasing this useless insurance for $140 worth of tickets. I have never liked ticketmaster to begin with as the service charges are over the top. Now you add in this negative option billing insurance scam. What a crock. Just got some tickets from ticketmaster in the UK. Same Mondial / Ticketmaster insurance scam is still going. I will never ever use ticketmaster or Mondial ever again. I’m so angry about this. It’s fraud however they try and dress it up. If I worked for either of these companies I would be so ashamed I’d resign on the spot. I contacted Mondial and they cancelled it and sent me a confirmation. I too thought it was a scam. They appear legit but TicketMaster is who I hold accountable. It’s them I did business with. i bought the tickets from TicketMaster..
but there is a doubt regarding my VISA to US…m from INDIA…and dont know if my VISA will be granted or not..
but can u please tell me if Mondial Insurance Covers problems like this like VISA not granted..? I bought Mondial Insurance thinking I would be protected if I couldn’t go and that I would be reimbursed for my ticket price. Well I couldn’t go. Couldn’t get reimbursed either. Mondial Insurance is a scam. They take your money, and do not provide any service in return. Customer service is valued in a customer service industry. Why all the run-around? I’m going to every site where I can write a post. I also know someone who works for Live Nation – in the building off Hollywood Blvd., and who is working on the Ticketmaster implementation into the Live Nation system, to see if I can get Live Nation to drop offering Mondial Insurance. I couldn’t be more disappointed with their service. @Prince Dhillon – No you wouldn’t get your money back from Mondial Insurance if your Visa is not granted. Below is the link for the “covered reasons.” When does the right excuse make a difference? Reminds me of being a child. Your best bet is that your airline has a delay, and you can “prove” it. I’ve also read people who have “covered reasons,” jump through all the hoops of paperwork to show “proof,” and still get denied their claim. Ticketmaster website defaulted to this absurd optional charge when after rejecting the “insurance” initially I went back to verify informaton. Hassle getting charge reverse, had to do a dispute with credit card company. Next Next post: Mexican night!